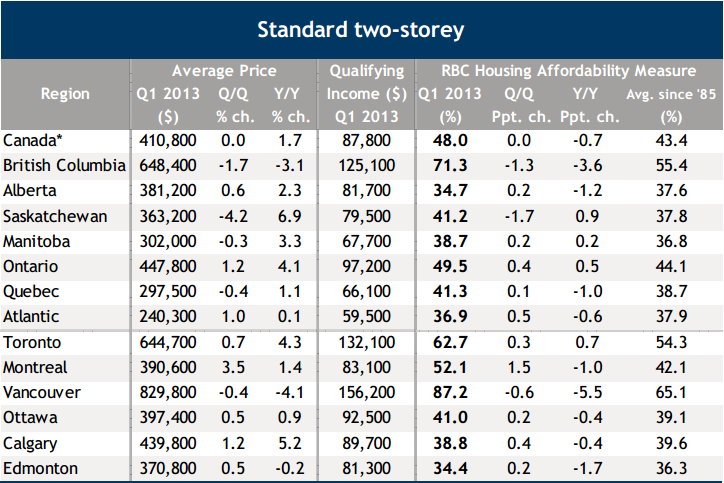 Royal Bank of Canada (RBC) released their housing trends and affordability report earlier this month, which examines the affordability of different housing categories across Canada. The first quarter of 2013 saw results similar to the last quarter of 2012, as buying a home at market price still requires a very large share of a typical household’s income. RBC’s report tracks three categories of housing: standard two-storey homes, detached bungalows and condominium apartments. The affordability measure shows the proportion of median pre-tax household income that would be required to cover the cost of mortgage payments, property taxes and utilities in a particular city. For example, an affordability measure of 40 per cent means that the cost of owning a particular home type (including mortgage payments, property taxes and utilities) in that city would take up 40 per cent of a household’s pre-tax income. The report states that typically no more than 32 per cent of a borrower’s gross annual income should have to cover mortgage expenses. The national affordability measures for standard two-storey homes and condominium apartments remained unchanged since the last quarter, at 48 per cent and 28.1 per cent respectively. 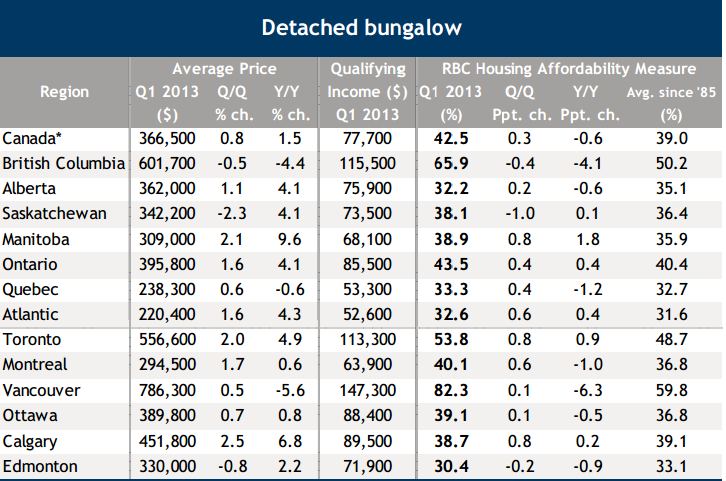 The detached bungalow category rose 0.3 per cent this quarter to 42.5 per cent. These results simply showcase how little movement in mortgage rates, home prices and household income keeps affordability at the same level. RBC analyzed the relationship between home prices and affordability, and concluded that national home affordability had not reached a dangerous level. Historically low mortgage rates have been the main factor in keeping housing affordable, for the last couple of years. If interest rates were to rise substantially, housing affordability could become a significant problem in Canada. However, mortgage rates are expected to remain low for the next two years, with only small increases expected by mid-2014. 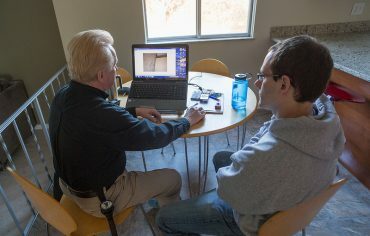 In addition, when interest rates do begin to rise, the increase will occur because the economy will be growing stronger and household income levels will be rising. A rise in household income will help offset the effect of higher interest rates, preventing affordability from reaching dangerous levels. Home resales in Vancouver have declined significantly in recent years, reaching sales levels 40 per cent below their 10-year average in the third quarter of 2012. The slide in resales began to stabilize in the last two quarters of 2012, but high home prices continue to characterize the market. For the majority of households in Vancouver, housing still remains unaffordable. 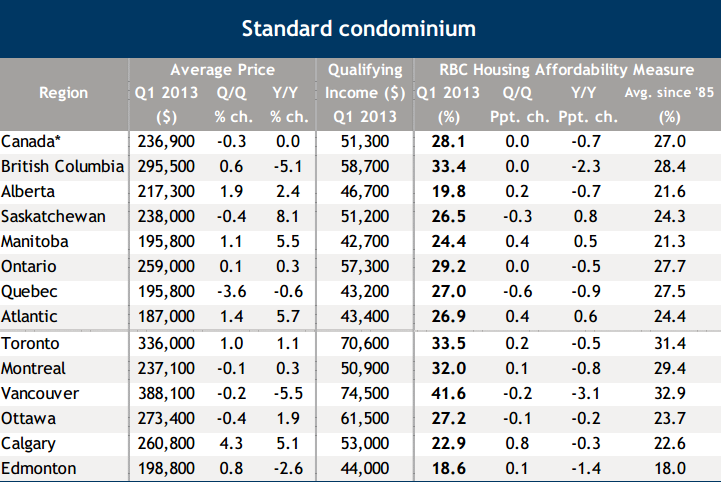 The affordability measure for a standard two-storey home in Vancouver is 87.2 per cent. The Toronto market remains stable in regards to home resales, which rose slightly in the first quarter of 2013, however, standard two-storey homes are unaffordable for the majority of households. The affordability measure for a two-story home in Toronto rose slightly to 62.7 per cent. 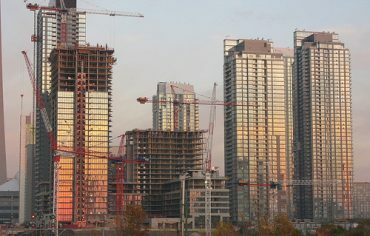 Condominium apartments are expensive in both the Toronto and Vancouver markets, but are the most affordable of the three categories measured in this report. Calgary remains one of the few bright spots in the national housing market. Home resales are rising and the Calgary market is strengthening, as a result of a strong economy, accelerating population growth and affordable housing. In Calgary, the affordability measure for a standard two-storey home is 38.8 per cent.